While Canadian Pokemon fans are eagerly awaiting the release of Pokemon Go, the delayed rollout to Canada gives businesses more time to plan marketing strategies for when the Pokeballs come out. Simply put, this game takes the idea behind the classic card-and-video game and brings it to the real world. Players use their phone’s GPS and camera to walk around and “catch” Pokemon. You can then go to PokeSpots to gain experience points and train Pokemon, or go to a gym where you can challenge other players to combat. Both Pokespots and gyms are real places, often spots of significance. This is what the game looks like when using the app on your phone. The new GPS-enabled mobile game has rocketed to the top of the App Store and has been installed over 5 million times on Android devices. In the US, it has been installed on more than 5% of all Android devices in the entire country. In just a meagre few days, it has more installs than dating app Tinder. There are more daily active users on Go than on Twitter. In short, this game is blowing up and is poised to take Canada by storm upon release (expected soon). So, how can your business take advantage and tap this massive customer base? Here’s a couple of tips to get up-and-running right away and stay ahead of the curve when it launches north of the border. I attended a session on social media strategy last week where the presenter emphasized the point that “social media levels the playing field,” in the sense that a tiny start-up or a grassroots not-for-profit are on the same level as major consumer giants like Nike or Apple. This…might be a stretch. Nike and Apple have teams of graphic designers pushing out special visuals, they have community managers talking to different audiences online, celebrities being paid to share their content and they’ve got the money to boost posts and run highly targeted ad campaigns. Compared to your one-person shop and limited budget. But perhaps, there is some truth to it. It is true that for organic content, you are using the same medium and once you’ve built an audience and earned Page Likes, you are delivering your message in much the same way every other brand in the world is. Even if Facebook limits organic reach to about 3%-5%, here are three quick ways to help reduce the gap between your organization and the bigger players. The marriage of comedy and politics dates back to MAD magazine covers, thoughts of Kevin Nealon and Norm Macdonald taking shots on Saturday Night Live’s Weekend Update, or maybe it was Roger Abbott’s Jean Chretien impressions and the whole Air Farce troupe. More recently, Rick Mercer and Jon Stewart come to mind. But the digital age has brought about more opportunities to push out biting comedy clips than ever before, and increasingly groups are using that tactic to involve young people. It’s not as simple as just putting up goofy clips to earn a laugh, though. Using comedy for political engagement is a tough balance. Twitter parties have proven to be one of the more successful ways to engage audiences with your organization or brand. The idea of hosting one can be daunting, but these easy tips should turn any Twitter party into a success. Anyone following this election has already become familiar with a few hashtags, namely #elxn42, #cdnpoli and #election2015. All organizations are vying for valuable space in that stream, but breaking through is a difficult task. That’s why we recommend targeting local news hashtags to ensure your message is seen. For example, here in Ottawa we use #ottnews when talking about a local issue. Similar hashtags exist across the country and are important sources of information for the public and media alike, boosting your opportunity to attract media coverage. This doesn’t work for everything, obviously. Big, national issues are not, by definition, local news. But don’t write off an issue too quickly. Try to find local angles and build those in. If you want to focus on health care, look at hospitals in the region and see if they’ve made any recent news. If you work for youth engagement, see if local post-secondary institutions have received public attention. Then alter your message on a national issue to be relevant to local level, and benefit from increased engagement with that audience. So far, this election has been rife with candidates dropping out of the race due to social media gaffes. We’ve already written about this here, but the topic was a big hit at last night’s pre-debate panel with Ian Capstick and Kate Harrison, so it’s worth diving into a bit further. Even just two days ago another Liberal candidate was pulled for comments made on social media. Obviously, the most important piece of advice regarding social media is that you should never tweet/post/Instagram/Vine anything that will come back to bite you. For a long time, users of platforms like Facebook and Twitter demonstrated naivete about just how public those platforms were. Up until a few years ago, privacy on social media was an afterthought. So You Want to Become the Next @norm? There’s no denying that @norm was the Twitter account to watch in August. The 74-year-old Toronto city councillor raced to 130,000 followers and earned recognition in every major media outlet in Canada. So, how do you replicate that success? While understanding the web works in weird, wild and mysterious ways, there are some important best practices to learn from @norm. First off, be up-to-date on the biggest news in pop culture. 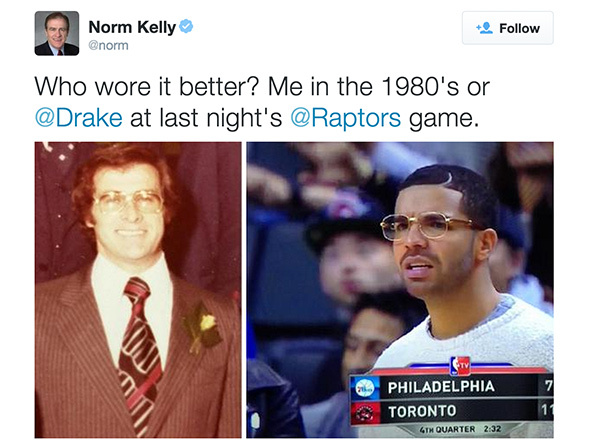 Norm’s real rise to infamy came from him inserting himself into the rap beef between Toronto’s Drake and Philadelphia’s Meek Mill. Knowing what headlines are most important among the millennials that are most active on Twitter offer the best opportunities to be the next best thing.